Hi everyone! We’re here today to tell you about our DNA test results. 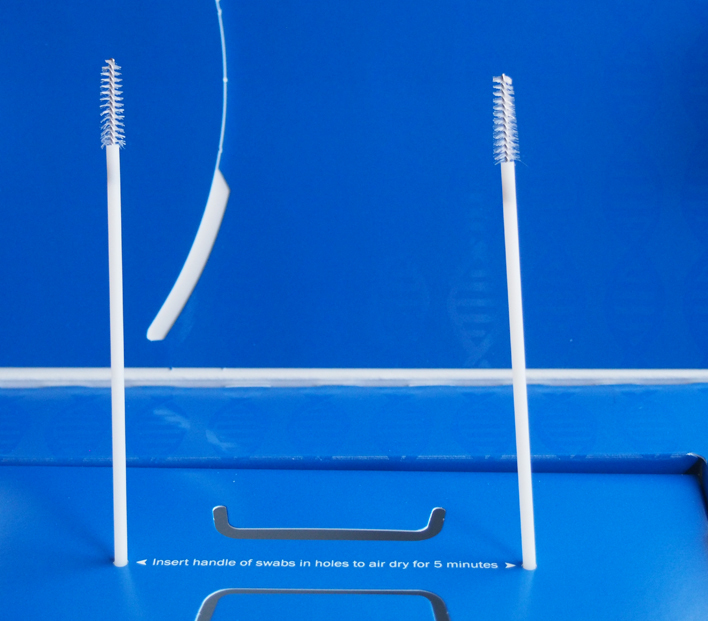 It took about 4 weeks from the time we mailed the swabs before we could download our report. Like we said in the previous post it took two weeks just to get to their facility. After that it took the advertised 2 weeks to process our samples. It seemed like a long time but we were glad that we did it. Okay without further ado here are our results. First up is Millie. Here is the summary report of my family tree. As always you can click on an image to make it bigger but I will also show you a close up of each half of my heritage. Here is the left side. They don’t specify which side is for your mother and which is for your father. This side comes as no surprise to anyone in this house. 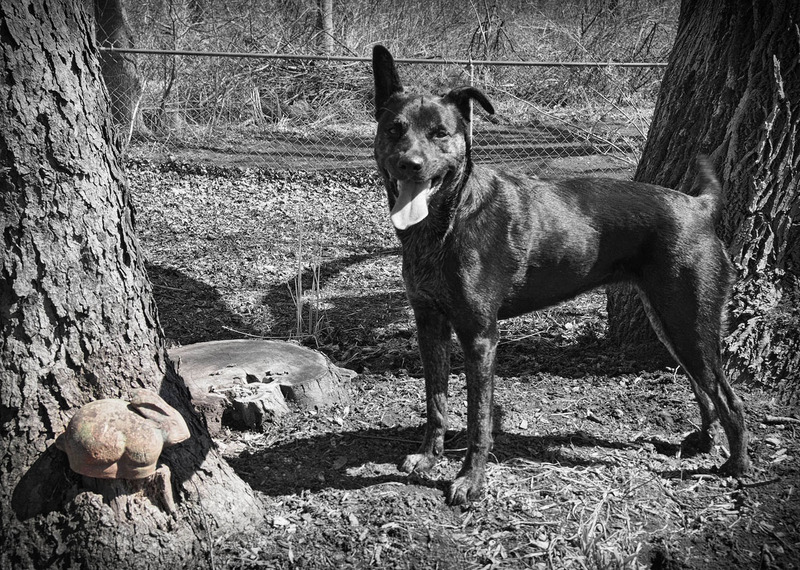 As you can see the only specific breed the DNA test found on this half of my family tree is American Staffordshire Terrier (more commonly know as a Pit Bull). Mom and Dad have always suspected that I had a lot of Pit Bull in me. My reaction to having a stick up my nose (only sneezing and never pawing at my face) and some of my physical characteristics (especially of my head) were key indicators. Okay now on to the next side of my family. 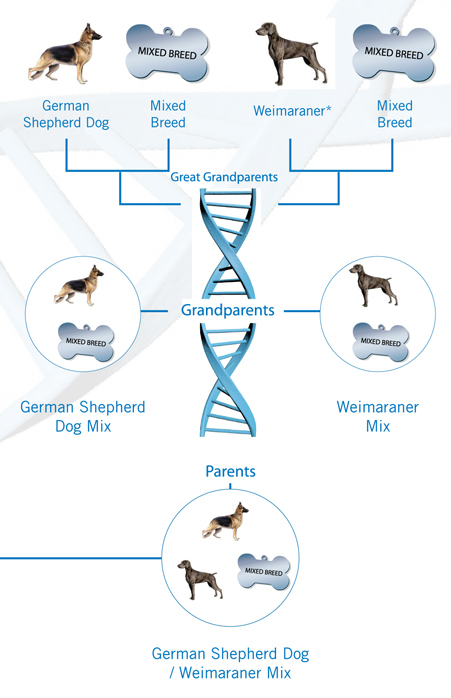 I have to say that the German Shepherd Dog was no surprise here but I was pleasantly surprised to see that I’m also related to some pretty cool Blogville pups on this side of my family. Who would have guessed that I could be related to Goose, Easy and Starr? 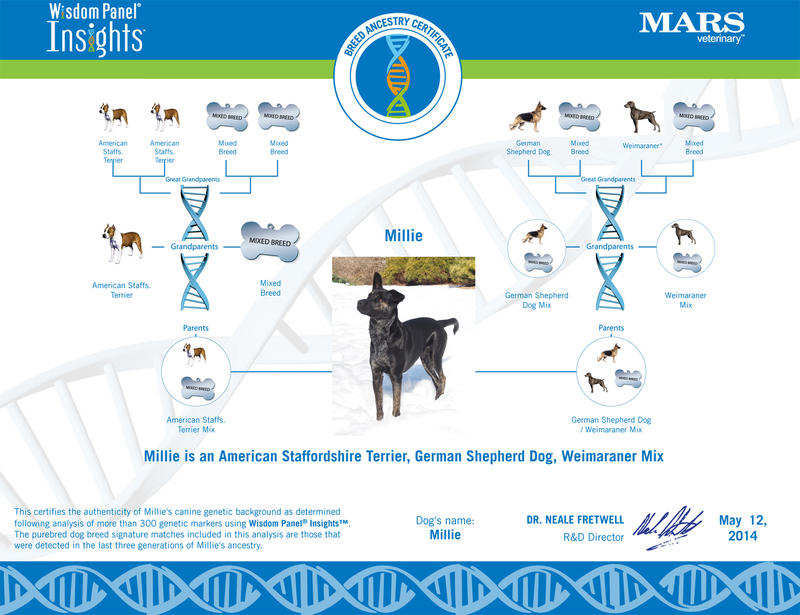 A portion of Millie’s ancestry was predicted to be mixed beyond 3 generations. 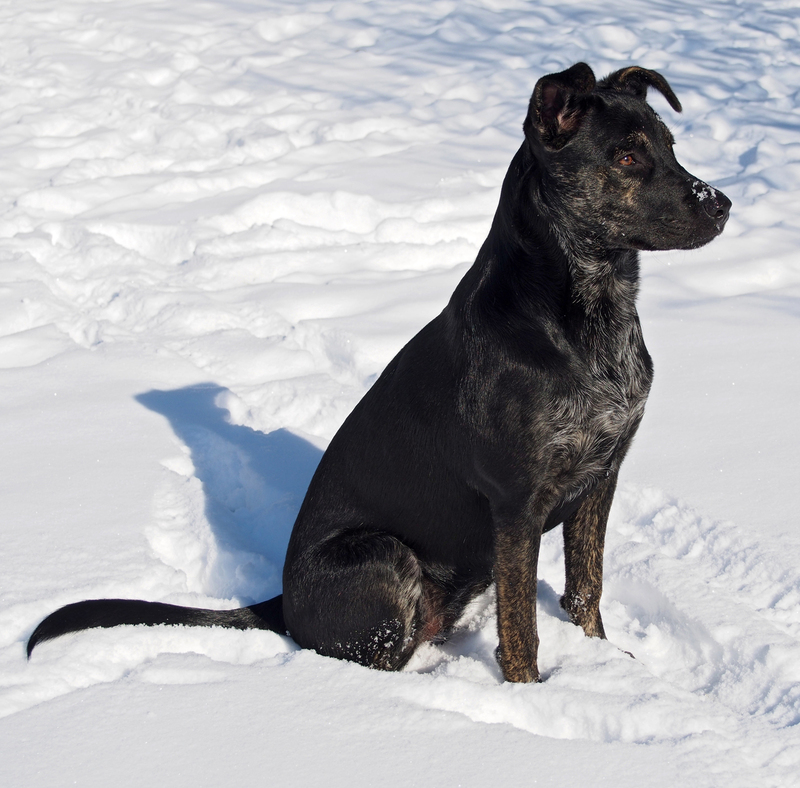 While it is difficult to identify strong breed signals in this mixed portion, the 5 breeds with the strongest statistical likelihood identified in the analysis of your dog’s DNA are listed below. 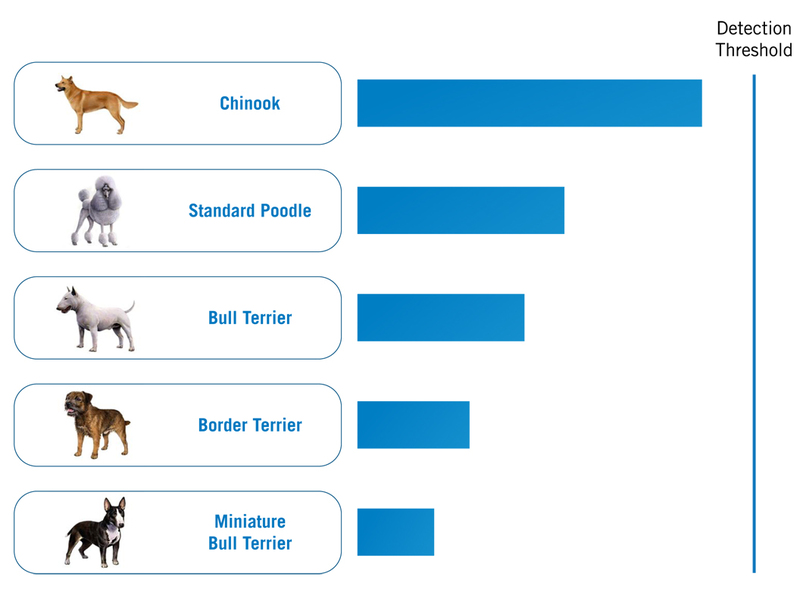 The breeds are listed by the relative strength of each result in the analysis with the most likely at the top of the list. 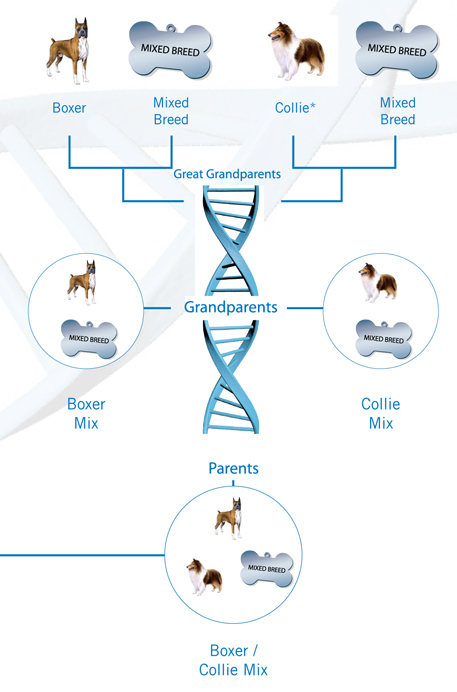 One or more of these breeds could have contributed to the genetic makeup of the ancestors indicated by the mixed breed icon. 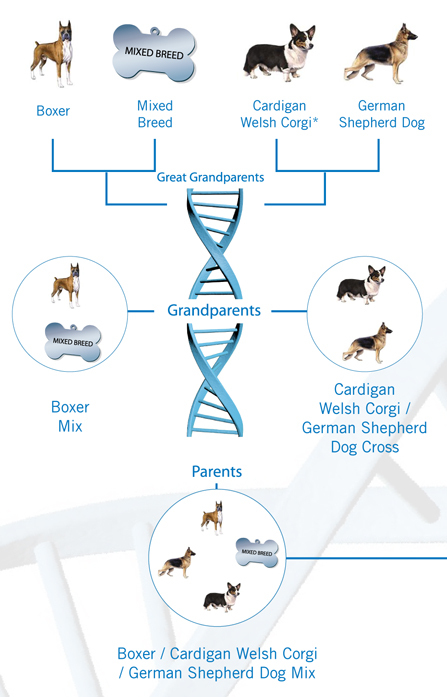 Note that it is highly unlikely that all these breeds are present in Millie’s ancestry. 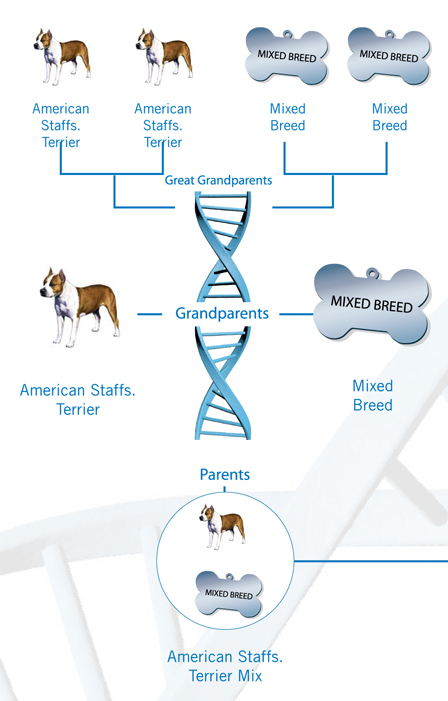 There could also be a breed or breeds present in the mixed breed component that cannot be detected with the current database of over 200 breeds. We’re not too sure about that Chinook since there aren’t too many of them around but it sure is interesting. If you are interested you can download a PDF file of the full 12 page report to read more about what they say about me. Okay enough about Millie now it’s my turn. Here is my summary report. Here is the left side of my report. It was really no surprise that I have a lot of Boxer in my DNA since I have the shape and head of a boxer. As you will see it shows up on both sides. We also weren’t really surprised to see German Shepherd Dog either. 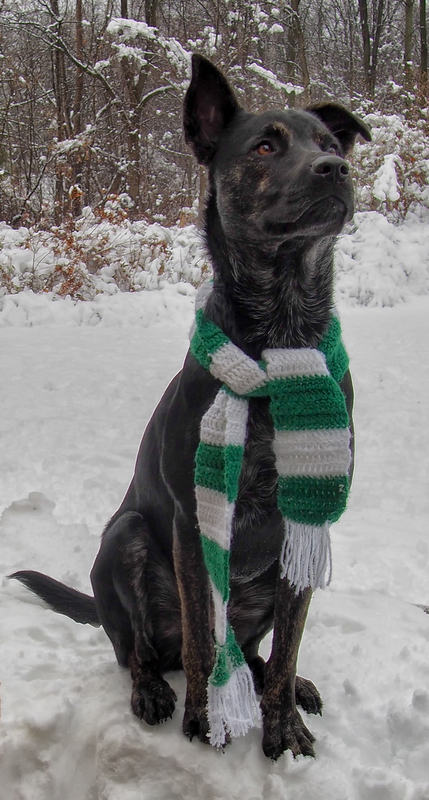 My coat is definitely not very boxer like and has a lot of GSD like qualities. 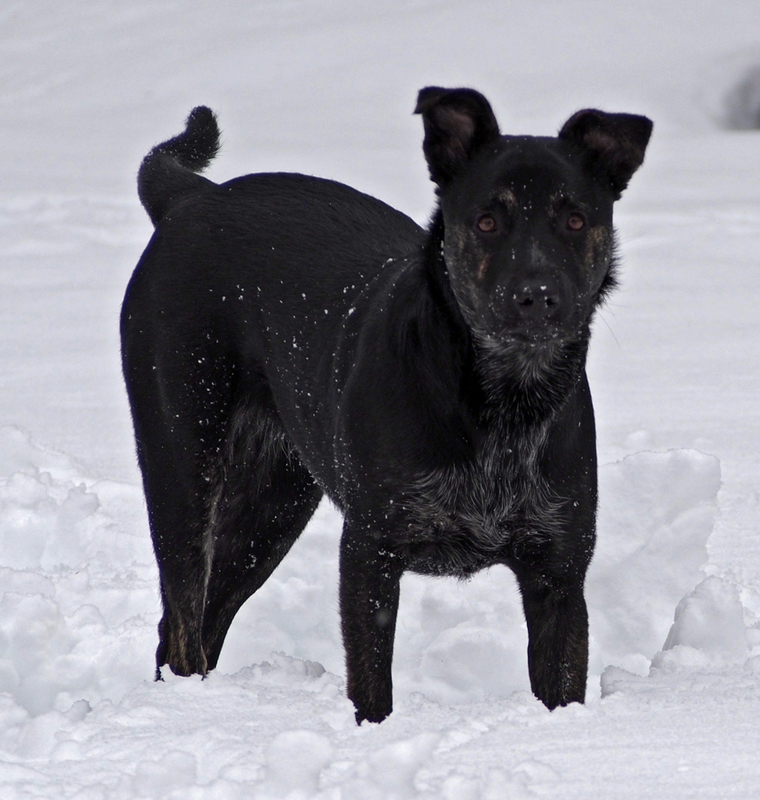 What also wasn’t a big surprise was to see another herding breed in the mix. Which brings me to the other side of my family. 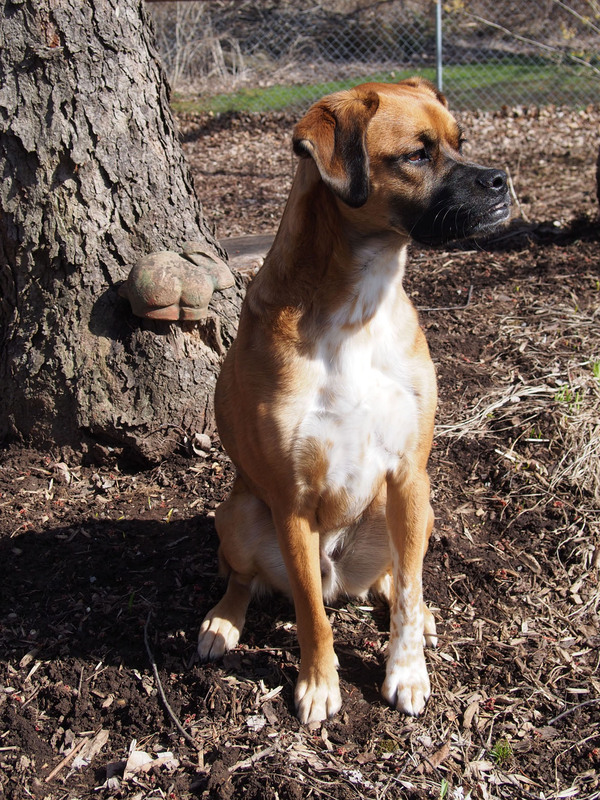 This side looks a lot like the other side with a strong link to the Boxer breed and another herding breed in the mix. I don’t know if you remember but I like to stalk and herd Millie sometimes when we are playing outside. 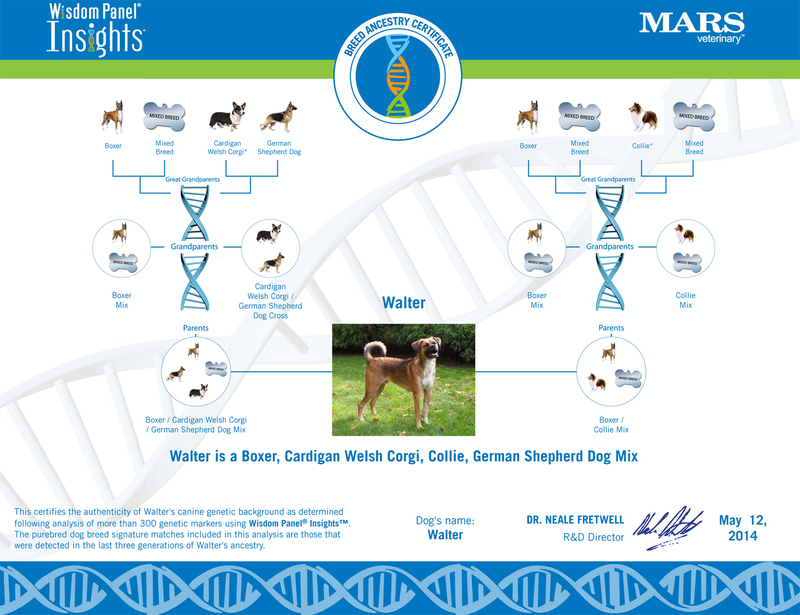 As with Millie’s report here is my mixed breed analysis. 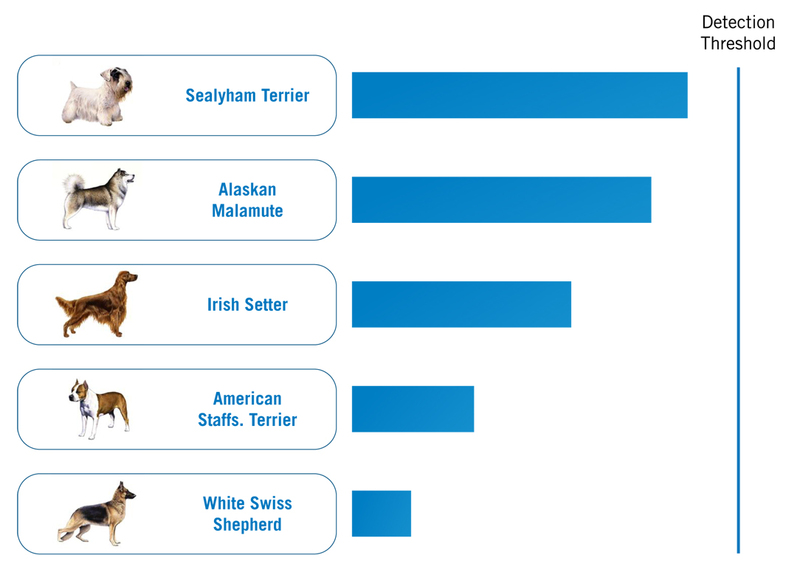 Another interesting mix of breeds that I could be related to. Here is a link to the PDF file of my full DNA report that you can download. Well there you have it. 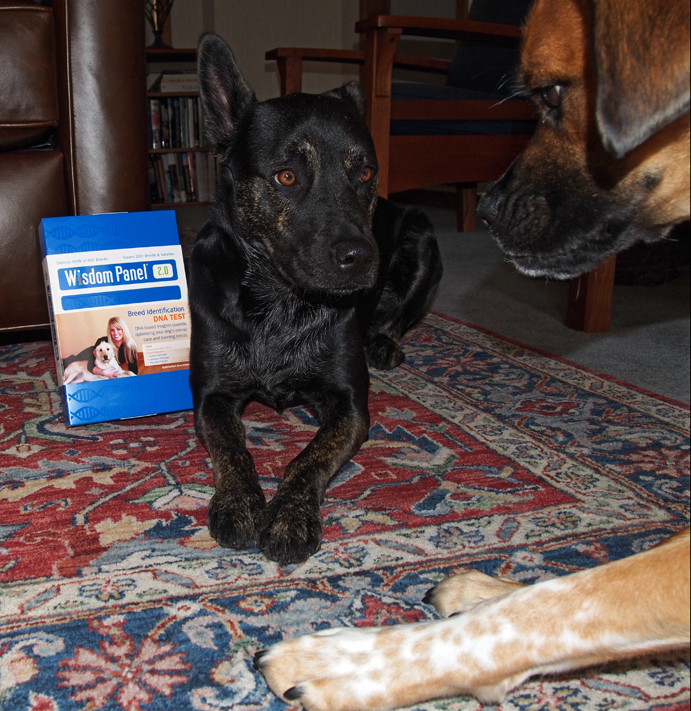 We think we will call Millie’s breed a Staff-Herd-Aner and Walter can be a Box-Herder. We hope you enjoyed learning more about just what a Millie & a Walter really is. Hi everyone it’s Millie & Walter here. First we want to make sure you all have your paws crossed for our good friend Goose. He is very sick and has spent this whole weekend at the vets. 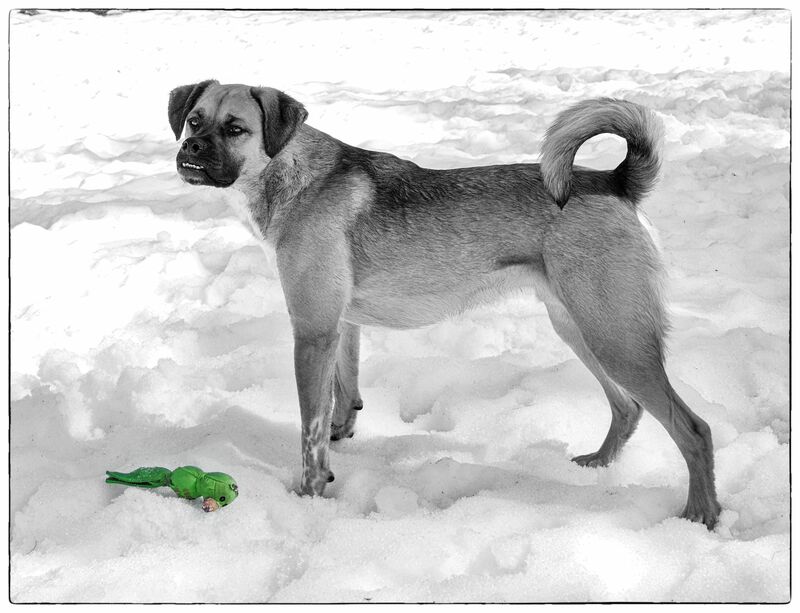 Please visit Murphy & Stanley’s blog to see how you can help Goose and his Mom out. Now on to our post for today. You all know that we are both of unknown heritage and every time someone asks our pawrents what kind of dogs we are they shrug their shoulders and say, “We don’t really know”. 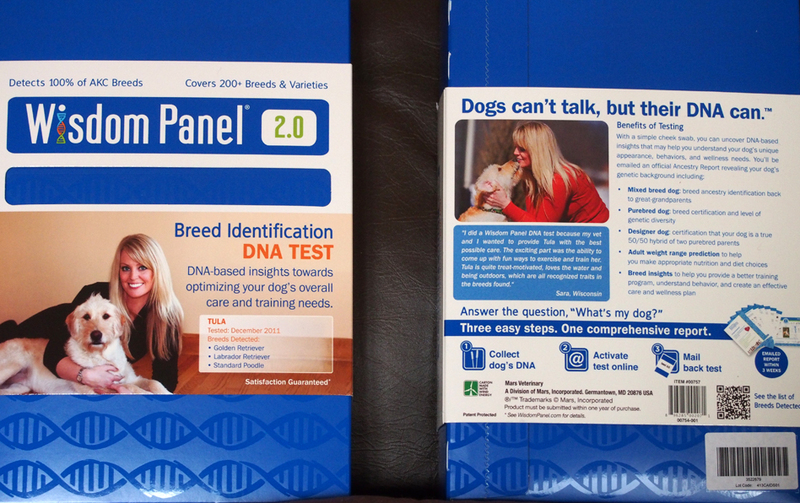 Well they decided to do something about that and ordered these things called Wisdom Panel 2.0 from Amazon (there are other places that sell them too). 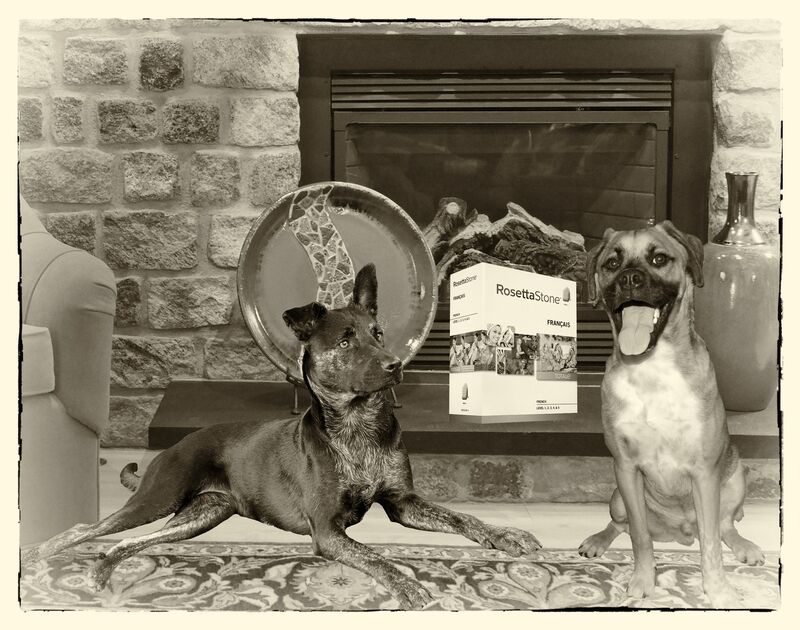 Of course mom made us pose with the boxes first. I’m pretty smart already I don’t understand why mom and dad think we need more wisdom. Walter I’m a little nervous about this wisdom thing. There isn’t much inside the box. Just some instructions with stickers and a couple of brushy things. Next thing we know mom has lured us to the bedroom and one by one she tortures us with those brushy things. 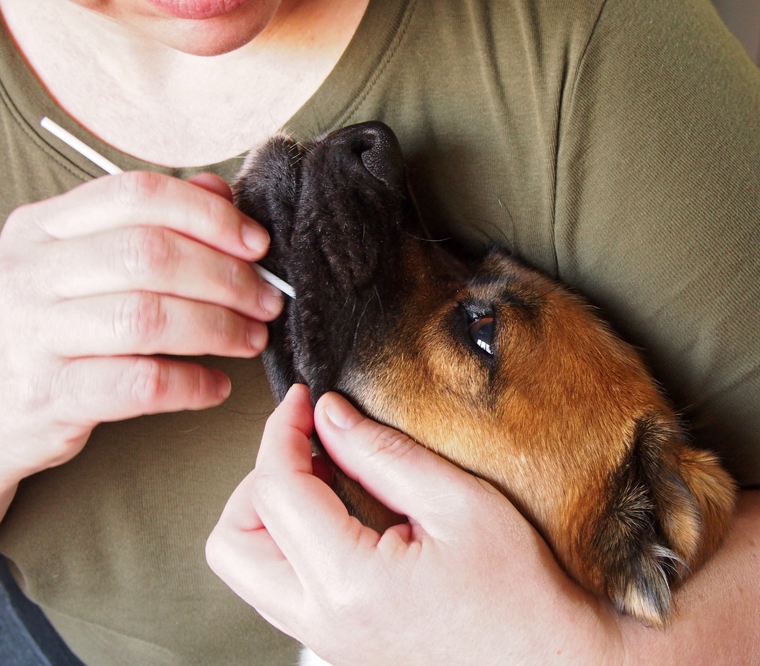 Just a little swab between the cheek and gum. Mom is pretty good at using a head lock. She stuck that brushy thing between our cheek and gum and had to rub it back and forth for a few seconds. Millie’s turn for the torture. 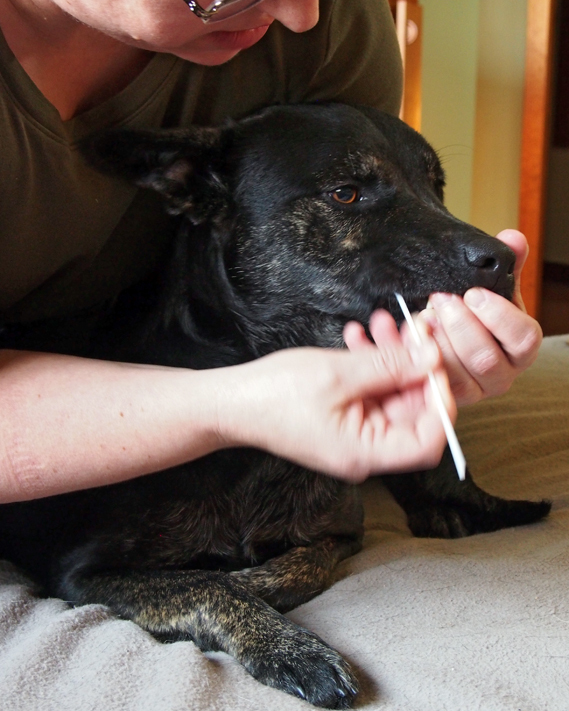 We each had to have this done with the two swabs that came with the kits. Okay if we have to tell the truth it really was nothing. Those brush thingys were very soft and we were done before we knew it. DNA swabs air drying for a few seconds. 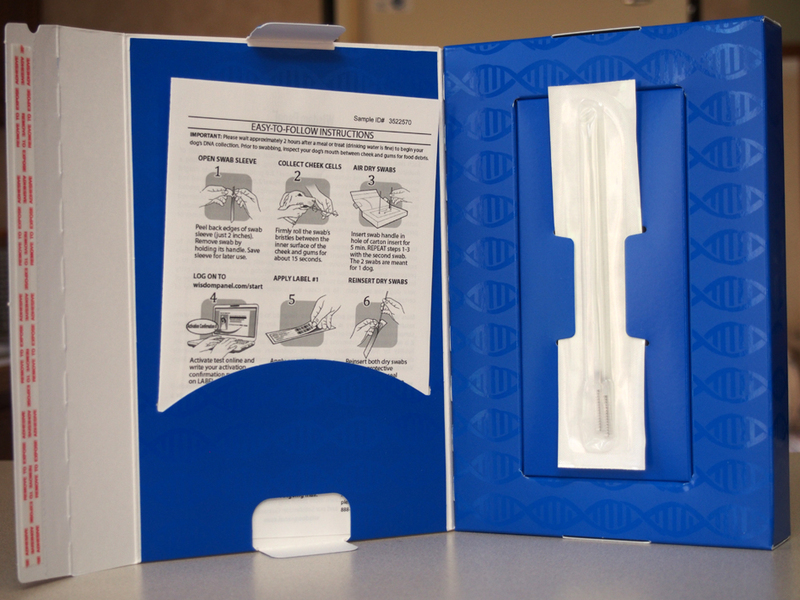 The box the kits come in are very handy and have these two holes in them to put the swabs in. You let them dry for a few seconds and then put them back in the plastic sleeve they came in. You use the same blue box to seal it all up and put the mailing label on. Mom had to be very careful not to mix up our kits. 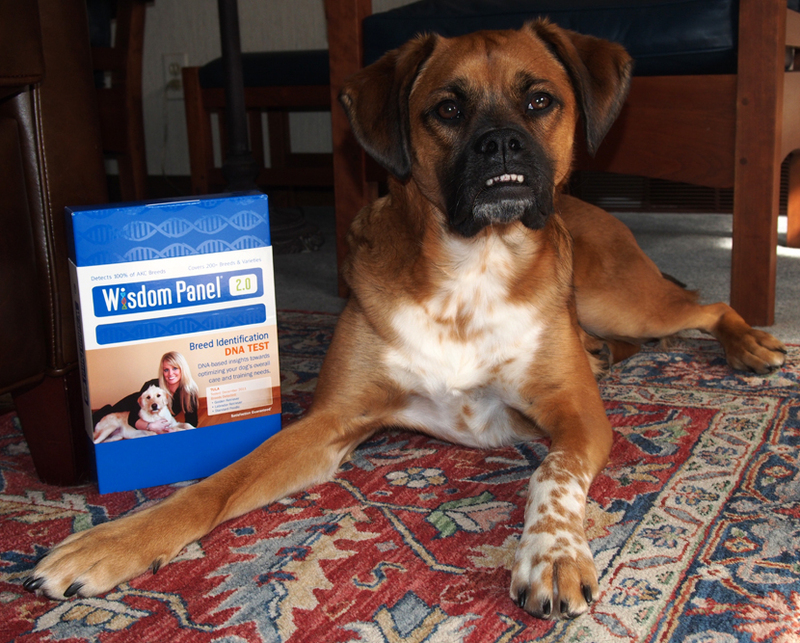 She put them in the mail and then she went online to the Wisdom Panel site to register our kits. You can keep track of the progress of your kits on their site. It took about two weeks for the kits to arrive at their facility (we think they were sent by pony express), then about two more weeks before we got our results. So what do you think we learned about who we really are? You will have to wait another day or two to find out. We will say that there were a couple of surprises but there were some things about each of us that we had already guessed as well so stay tuned. We’re getting ready for date day. Hey Tui there is a hint in this picture for where we are going. You may have to click on the image to make it big to see the hint. Millie is letting us double date with her and Tommy tomorrow. 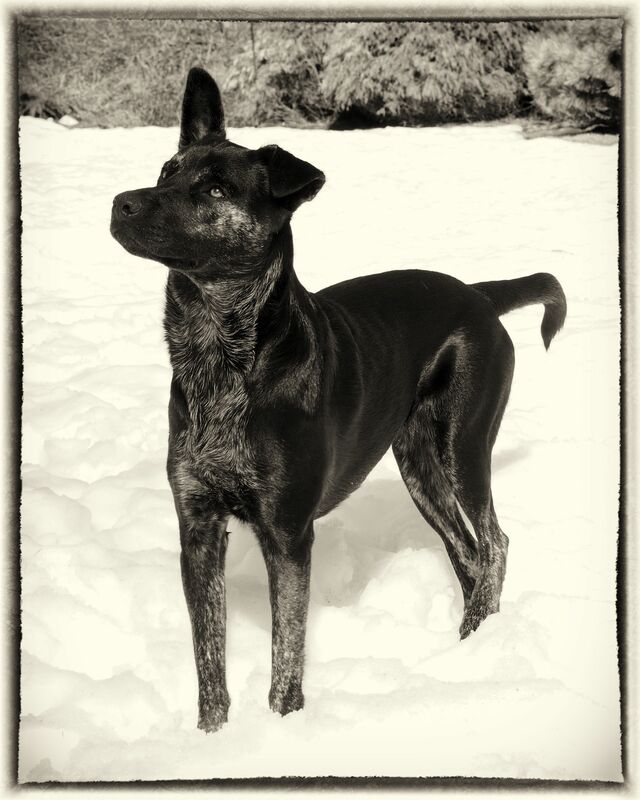 Black & White Sunday – Happy Easter! We’ve been looking all over for the Easter Bunny. This was the only bunny we could find. Hey Ranger do you think this is the Easter Bunny you’ve been looking for? Walter’s been looking for the Easter Bunny too. I get the feeling somebody is watching me. Hi everyone it’s Millie here. 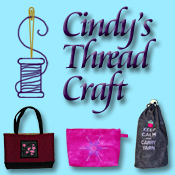 Today I’m participating in Mollie & Easy’s Time Warp blog hop. 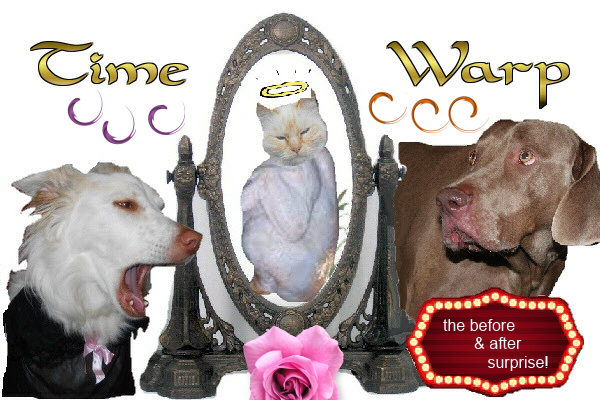 The idea is that we show before and after pictures of ourselves. Since Walter hasn’t even been here a year there wasn’t much “before” we could show so this one is all mine. First I will show you a couple of “before” pictures. And here is the “after” picture. Do you see the difference between the before and after pictures? Well let me tell you in case you can’t figure it out yourself. In the first two pictures both of my ears are only partially up and flop at the top, but in the last picture my right ear is fully up. 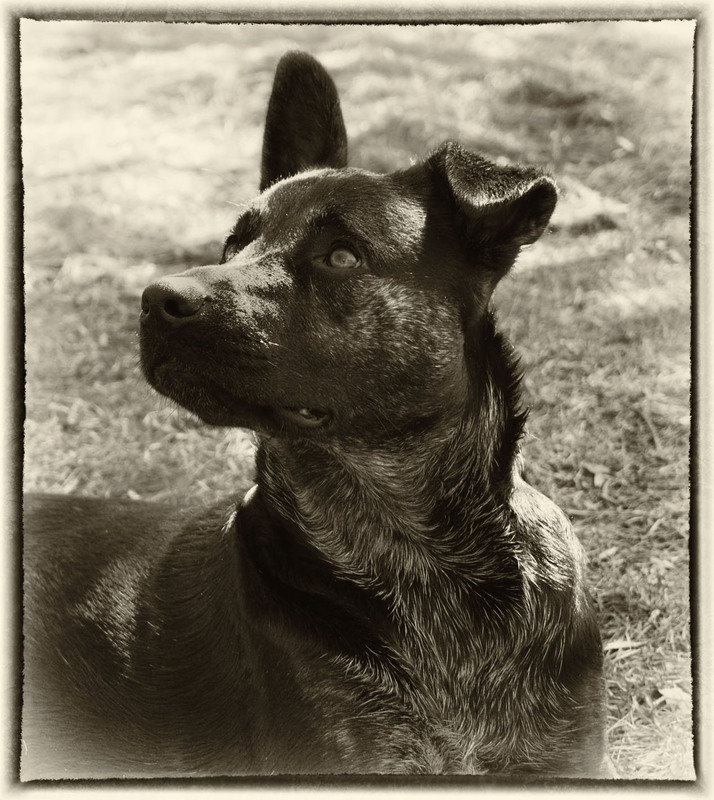 Some time last spring my right ear decided that it wanted to stand up tall, but my other ear has stayed only half up. Most people think it’s cute but I don’t really think much of it. That’s just the way I am.